EUSA Pharma has launched a new artificial saliva preparation, Caphosol, for the management of dry mouth and oropharynx as well as mucositis due to radiation or high-dose chemotherapy. 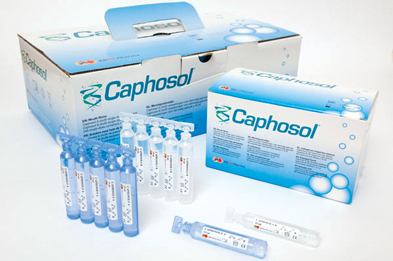 Caphosol comprises two separately packaged aqueous solutions, a phosphate solution and a calcium solution which, when combined, form a solution supersaturated with respect to both calcium and phosphate ions. It is an electrolyte solution designed to moisten, lubricate and clean the oral cavity including the mucosa of the mouth, tongue and oropharynx. Caphosol can be used four to 10 times daily and patients should avoid eating or drinking for at least 15 minutes after use.